Take Extreme Caution if you do this sensor installation yourself because the electrical lines will probably be energized and pose a safety risk! If you’re not sure what I mean then please have an electrician install these sensors for you. Notice how there is a sensor around both of the “hot” lines entering the panel, but not the ground or neutral line. The sensors are not directional, meaning Eyedro can be used to monitor power generation just as easily as power consumption. They’re also hinged to simplify installation. Also, be sure to confirm the rating on the sensors you’re installing are sufficient for your application. At the time of this writing, Eyedro only sells a 200A sensor (red and black). 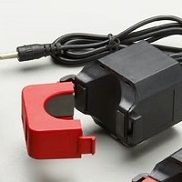 Simply clamp the eyedro sensors around the “hot” wires that are to be monitored, and ensure the sensor “snaps” closed. Next step is to route the sensor wires through the side of the electrical panel and out to Eyedro sensor module (black box). Here is a video by Jamie Boyd at Boyd Electrical that should also help. For additional information regarding installation of the eyedro sensors, please consult the eyedro product manual.